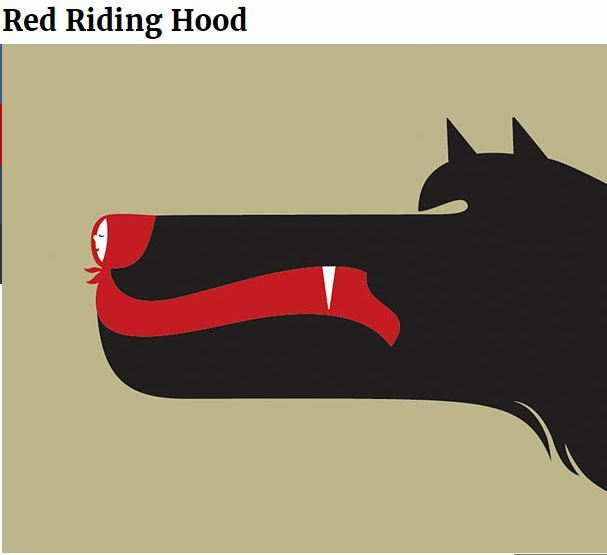 They are the same in one way or another- shape, height, pattern, texture, function or story etc. 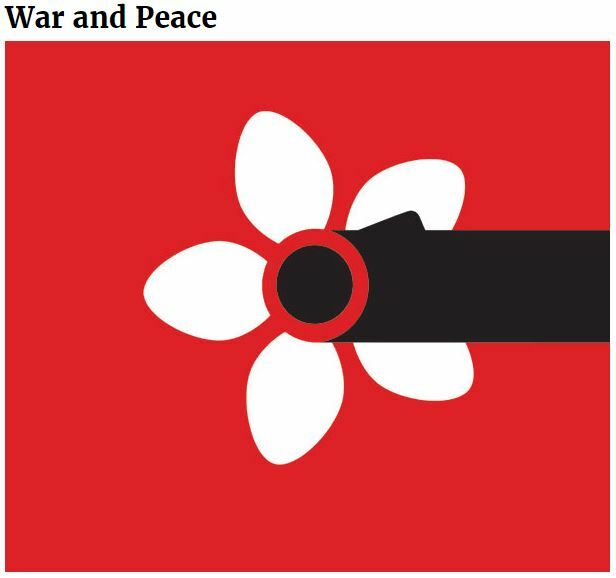 Or they are deliberately contrasting or clashing. A medium suitable for drawing line. 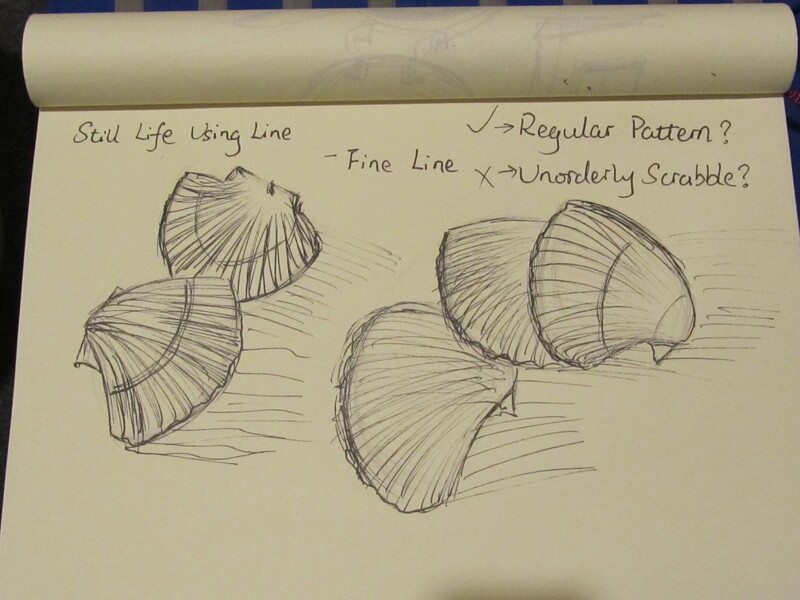 The last exercise reminded me of the shells, as I think their texture is best way to practice with sharp line drawing. 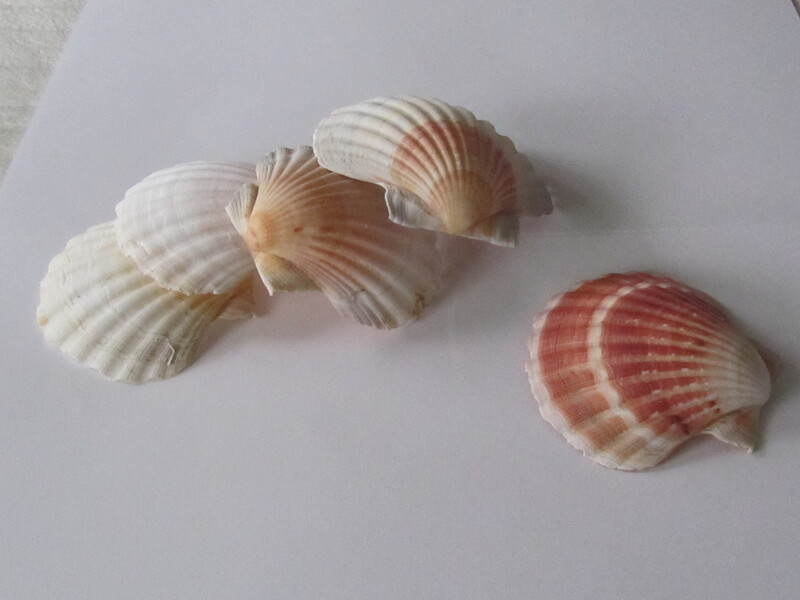 So I have taken some photos of shells. First attempt: I have drawn this picture by a black fine line pen in my sketchbook. Their texture are uneven but regular. So at the moment I need to think more before my next attempt. One of the way I am going to research and take a look of other coursemates’ work. Second attempt: I have found out a pen which I bought about my 20’s and it is a calligraphy pen. Then I used it to do the second attempt in my sketchbook. In this sketch, I need to find out the lines’ direction and effects. 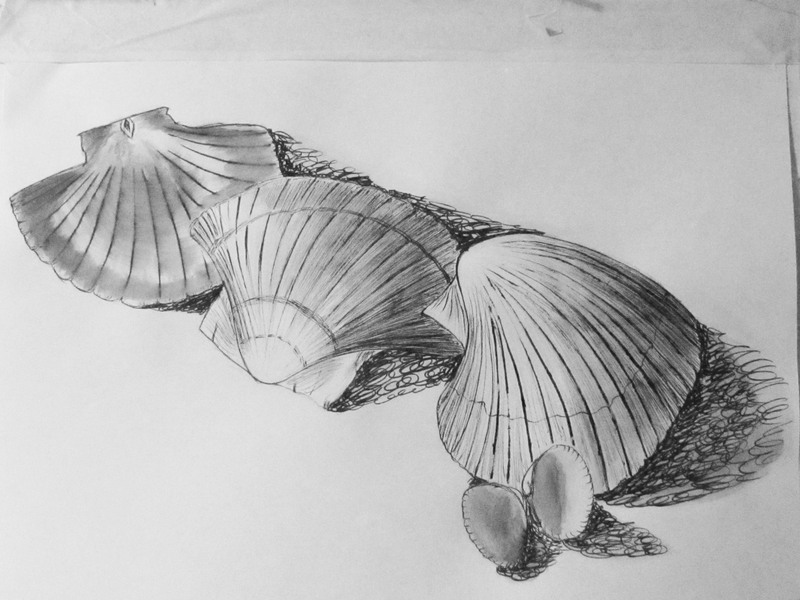 As shells are very hard shapes, I decided not to use any brush for lines in this exercise. Third attempt: I still use this calligraphy. I control my wrist and let the lines flow and fly. At the moment, I am thinking about the shadows, I am going to use lines or tones? At last I am moving on to a A3 170gms white paper. 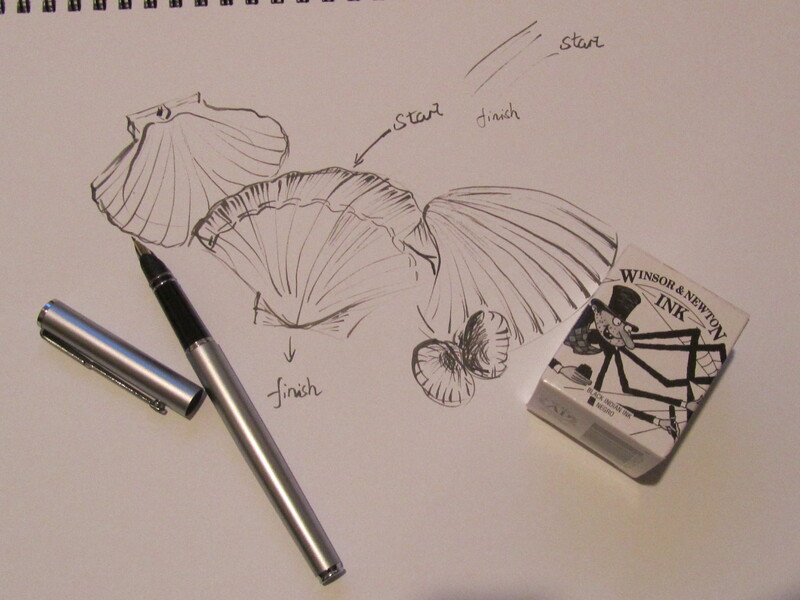 I have used the calligraphy on the right shell ( but when I stopped using it for the night I couldn’t get the pen working well). The fine line 0.5 for the middle shell. Then the fibre-tip 1.0 for the left. 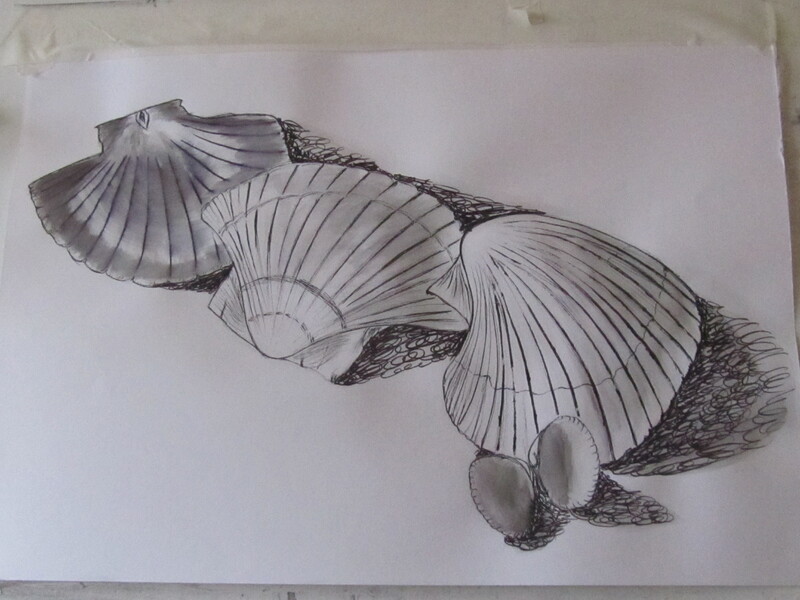 Before I scribble the lines on the paper I used a little bit of black watercolour wash as the shell’s base. Also I used circles for shadows. This is the half way work. The final picture. 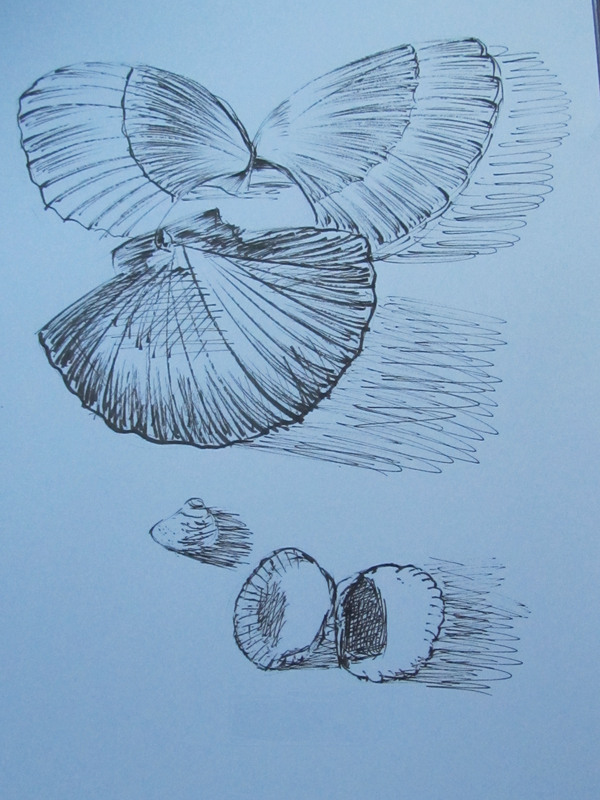 I have used the fineline 0.5 pen scribble the shells’ texture. 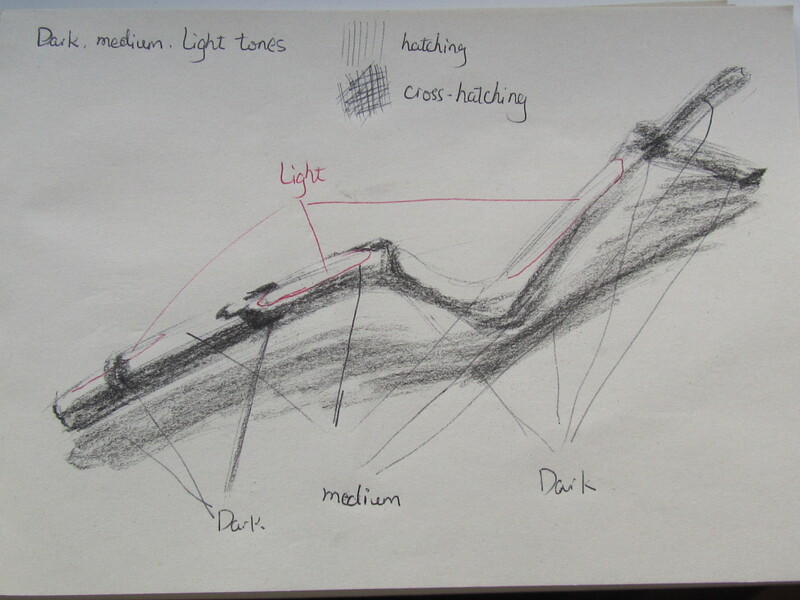 Also use the lines’ light and dark, thick and slippy to show the light direction. This exercise is principally to practice the lines. I am happy with the third attempt as there was not any presure (exercise/sketch) when I was scribbling it. I am also happy with the final picture even there are some lines are not neat and accurate when I was worried and feeling under pressure(final one). Then I got so much from that. Finally I like the flying, scribble or flowing lines. 1. Build up dark, medium and light tones. 2. 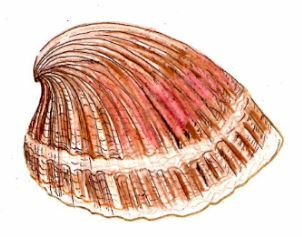 Use pencils with hatching and cross-hatching techniques. 3. 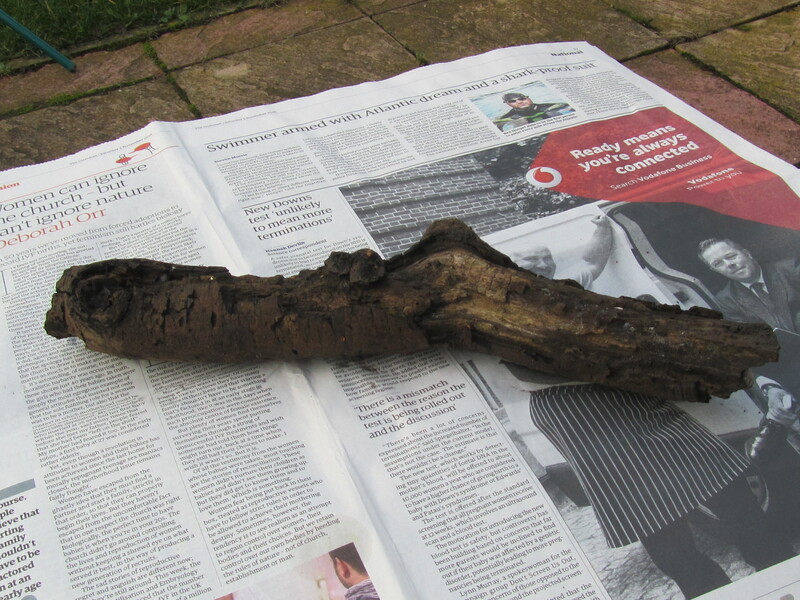 Select a single object: a shell or a piece of driftwood. 4. Combine soft and medium grade pencils and alter the direction the strokes. 5. Use smooth A3 paper and a putty rubber. 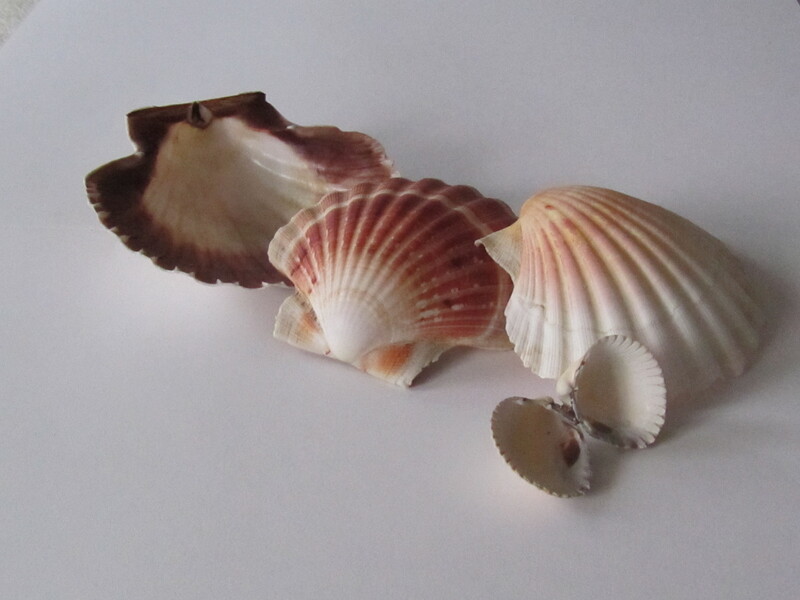 I have attempted a shell in an exercise for experimenting with texture in assignment 1. As my tutor suggestions “going over pass exercise” in my feedback for assignment 1. This is a very rough drawing. There are no clearly defined dark, medium and light tones. 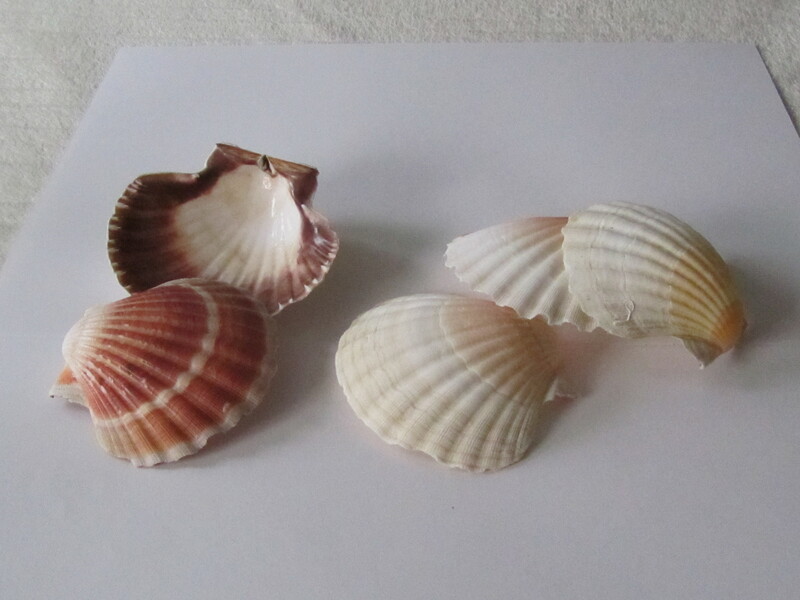 For the shell, on the right hand top side I need to add some more pattern as it is a fanshaped object. I live in Sheffield which is in the middle of country and I don’t have any chances to go to the seaside at the moment. I don’t want to skip past this exercise because the exercises are step by step to improve the drawing skills. So I have been to a park that is near me. 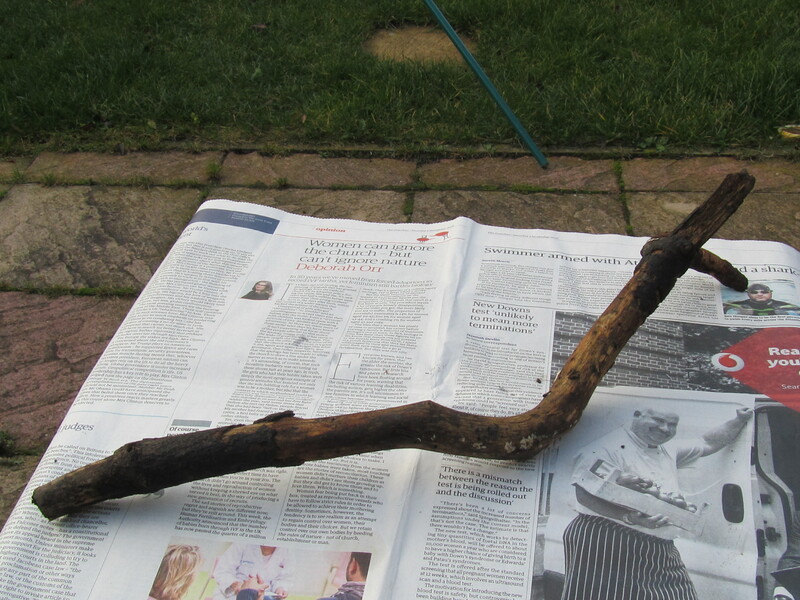 There I have picked up some woods from the forest. If I practice the surface I would like to choose the third one but for this exercise I want to attempt the last one which is a challenge for the three dimensions and its gesture. 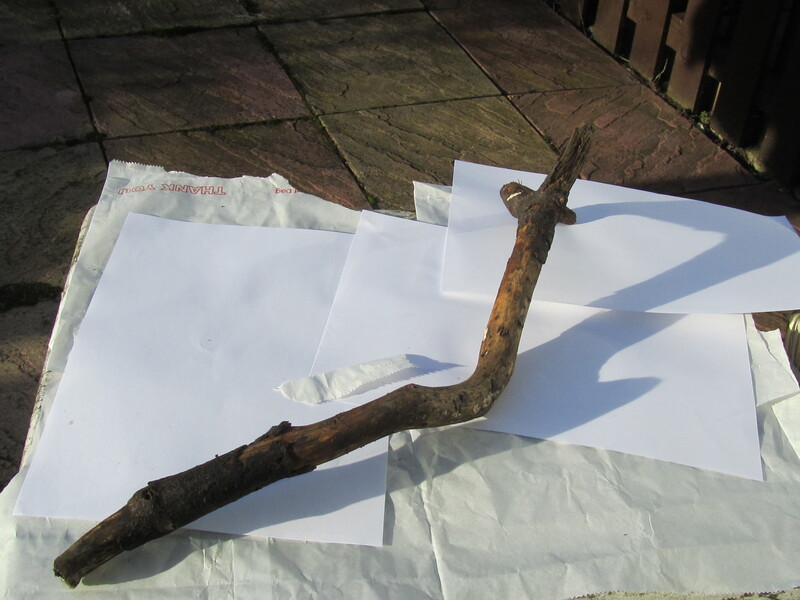 First step, I practice this piece of wood in my sketchbook. Find out the areas for dark, medium and light tones. This photo had been taken on a cloudy day, but later the sun came out. So I decide to take some more different photo angles. Now I can see the shadows are very clearly. Then I am moving on the A3 170gsm paper. I started from teminato by 4B pencil then darker halftone to shadow(6B), then the light halftone(2B-HB) and highlight(2H) to edge. This is half way to finishing the final picture. I stepped back from it. I need to refine the detail of the area where with the barks on it. I also need to shade the shadows’s area. I am happy with the final outcome but I think I have to leave the negative space where I didn’t give any tone to the left top corner. This is because as the light comes from this way and the light from here is going down the right hand corner where it is darker. I think I have give sufficient contrasts to all the areas to let them stand out in the three dimensional space. 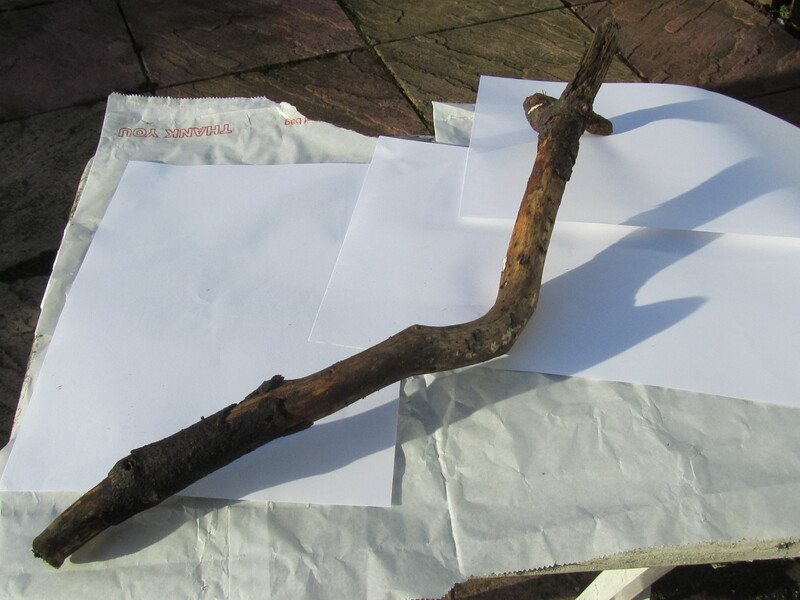 I think that the branch at the top that comes out at an angle is not correct with the original picture. But I will leave it and remind myself to observe in further drawing. 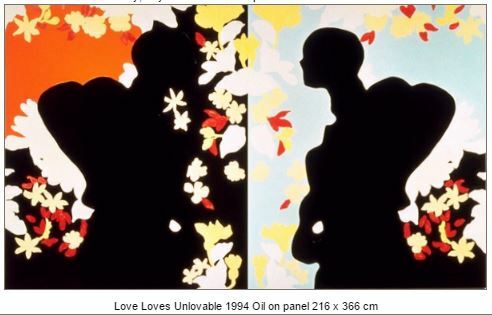 Positive and negative spaces are an important role in determining the overall composition of an art work. 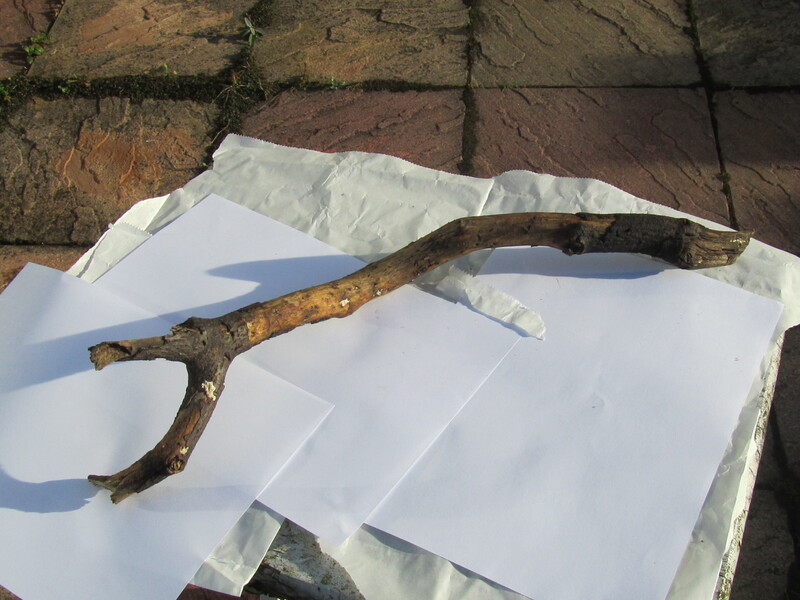 Through this research point, I am trying to find out some useful ideas to improve my objects’ rationale composition. First I am going to look at a range of artist working today and see how they incorporate positive and negative spaces in their work. Hume is a painter, printmaker and draughtsman and his earlier work the most well know are his doors. He depicts everyday subjects using high-gloss industrial paints. 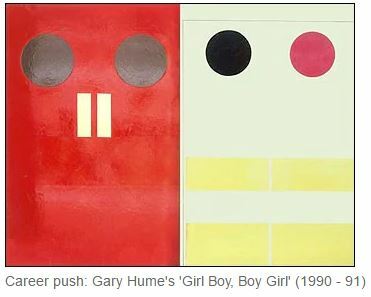 Later Hume abandoned doors and turned to paintings in household gloss paint on aluminium panels. Then in 2005 Hume revisited his door pictures, this time anthropomorphising the doors with lovers’ titles. I liked this one. There are only three dramatically simplified plate colours. 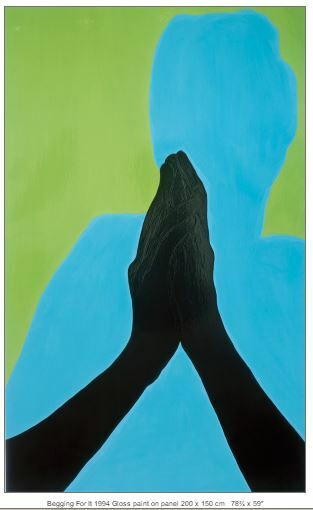 The man is seen with a pose which has the black hands putting the palms together/ zen gesture and Hume drew a bright blue silhouette then a green background. 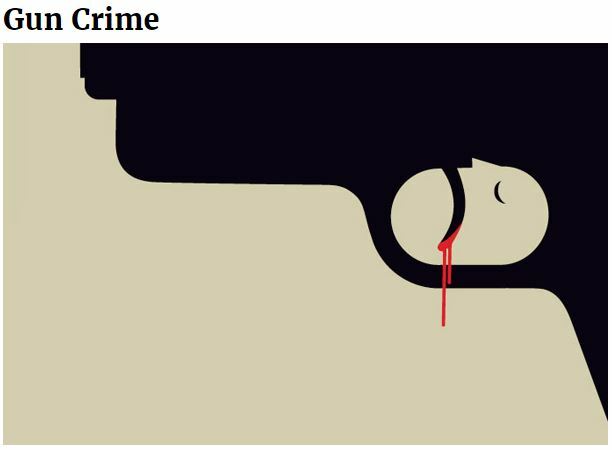 Bar is an Israeli illustrator and he used very clever ways with negative spaces to create thought provoking illustrations. 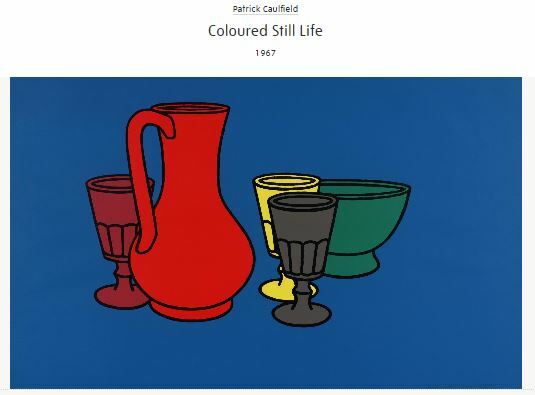 At last I have looked the artist Patrick Caulfield‘s work. 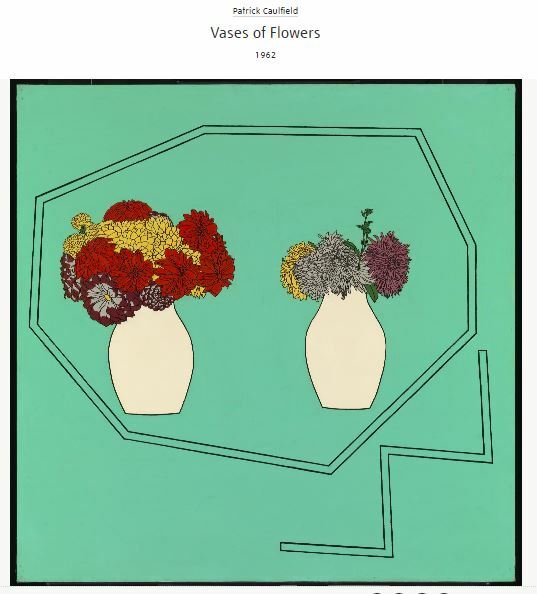 Caulfield used sharp edges as the table’s shape and the legs of table and colourful blocks as the abundant flowers. This bunch of black and white flowers are strongly showing the direction of the light. The objects in this still life are colourful blocks and they are positive. The blue background is the negative space. There is a gap between these two types of objects and it looks like the numbers are split 2:3. However the left side(2 objects) has a big red vase so the actual size of the objects looks balanced and they look to have equal weigh, this is very interesting. 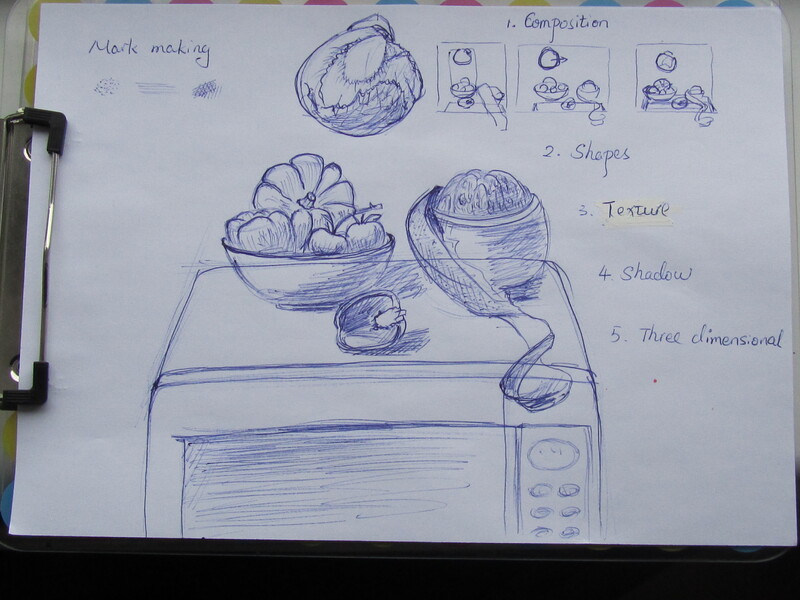 Before I am going to do this assignment, I am going to research some still life and mark making procedures. I especially liked these two. It seems that they were easy to produce but still are very vivid images. 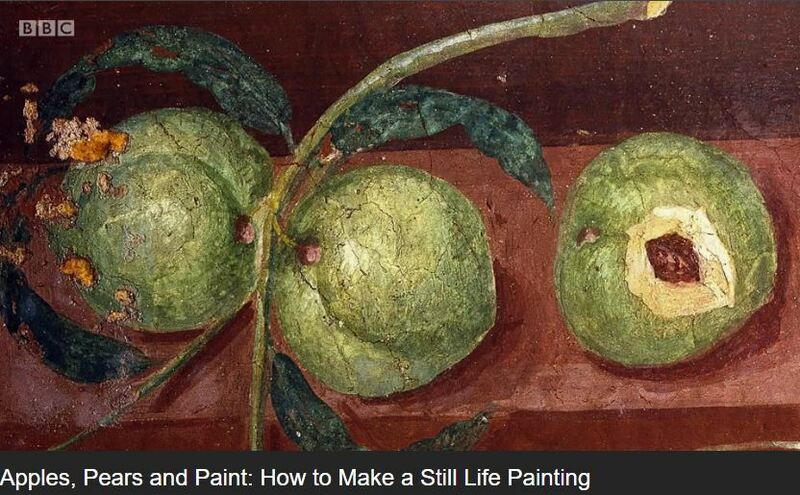 Also I found a article which is Making a mark/What is a still life? It gave me lots of ideas that I could try. 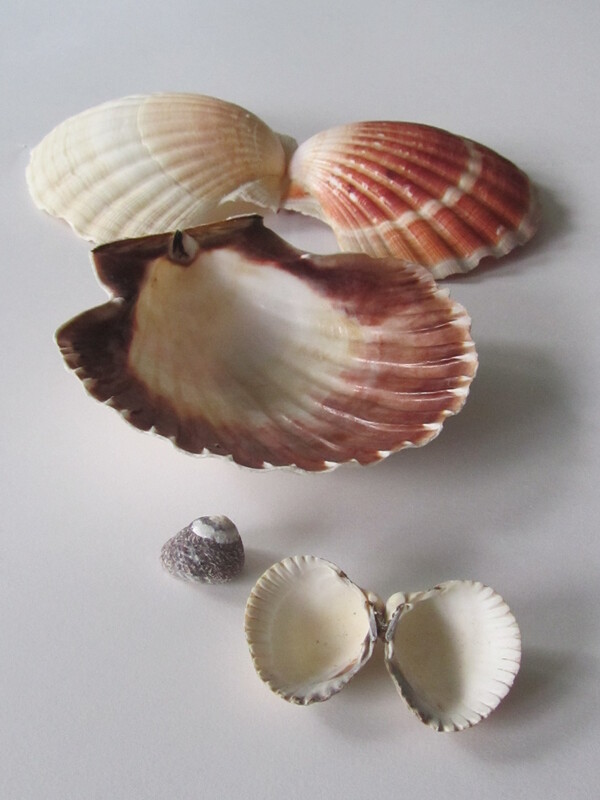 For this assignment, I have been asked to find a few objects to form a still life. 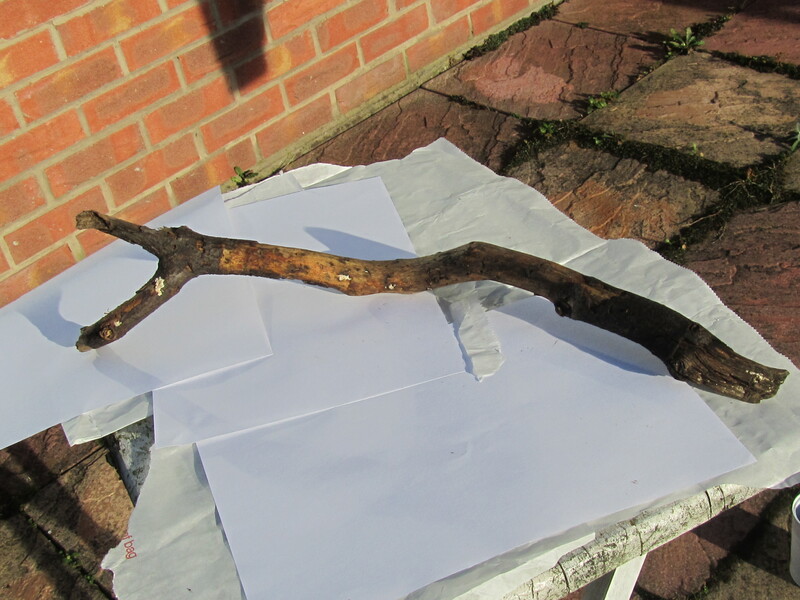 They can be natural objects, made objects, big or small. They can be ordinary, funny, practical or a mixture of all these. They trigger a response for you. So I took my camera then shot some photos with these objects which I have gathered. First picture is ordinary still life. The second is very interesting one but I can’t say which object or point is the main element. The fourth one is a funny one but scary to my husband because this bear’s nose got broken when we used to wash her in the washing machine (So we only wash her by hand now). The third is an enlargement of the objects in the second image, I am going to use this one for my this assignment. Attempt 1 (A4 sketchbook). Experiment mark making of the objects. After took these photos I saw some cabbages’s that had shapes and textures that are really beautiful when we were shopping in Morrisons. I have bought one just for swapping the object with the lettuce in this assignment. I can’t take the whole picture again because the pomelo’s skin is not fresh any more. I need to change from landscape to vertical. The highlight on the pumpkin is not right direction. Which object is the main/central element? 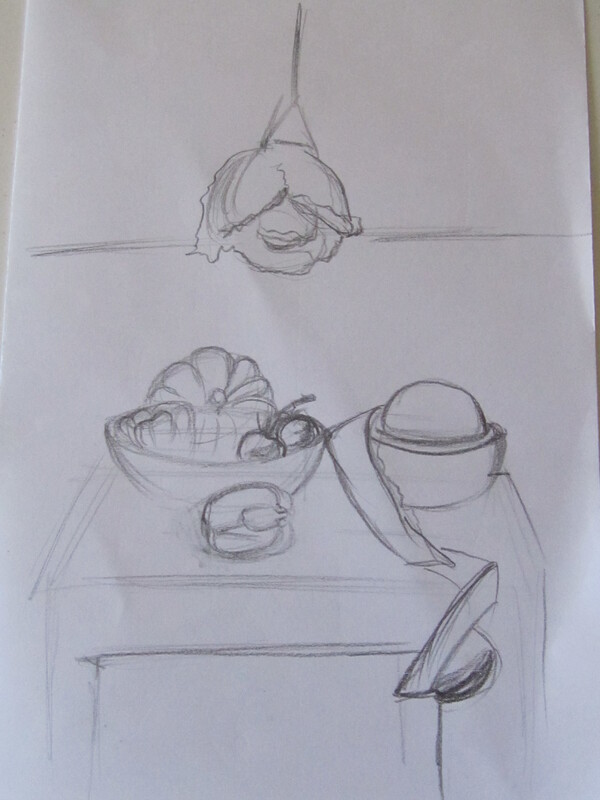 Then before the last final piece, I have done a thumbnail sketch. I put a thumbnail and two experimental exploring texture sketches from last exercise next to the final piece. At last I got to practice my final image on A2 220 gsm cartridge paper. I used charcoal and putty erase. Composition of the picture, I could move the objects at bottom so there is more room to move the cabbage down so they are closer together. The bottom of the pomelo, It wasn’t correct position compared to the photo. 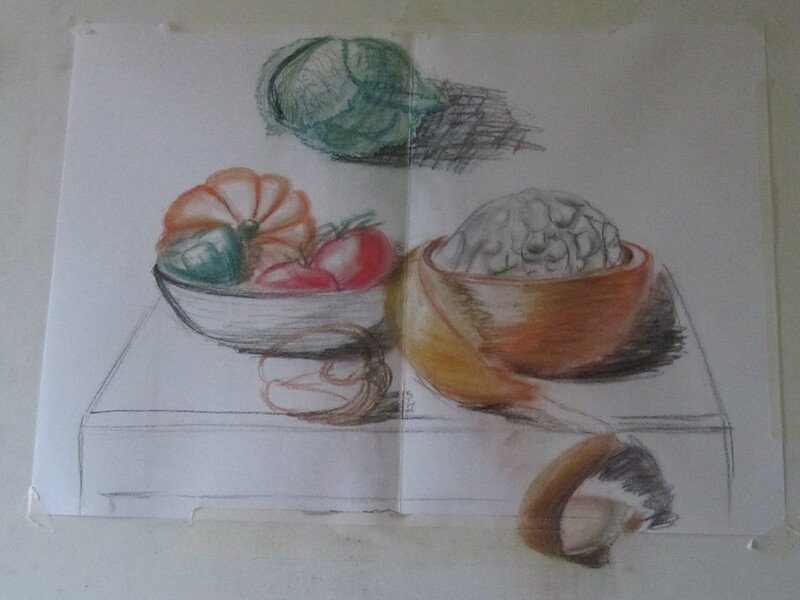 I tried to draw the peel falling away from the fruit but I couldn’t get it as I would have liked. I was not sure how to draw the texture of the pomelo skin. I used dotting marks to try to show it but I think there can be a better way. I have looked at the work of the artist Vincent Van Gogh who is famous on mark making work. I really like the way he depicted the sky. I will try to learn from this to help me with my future work. I have a question which is about light direction. 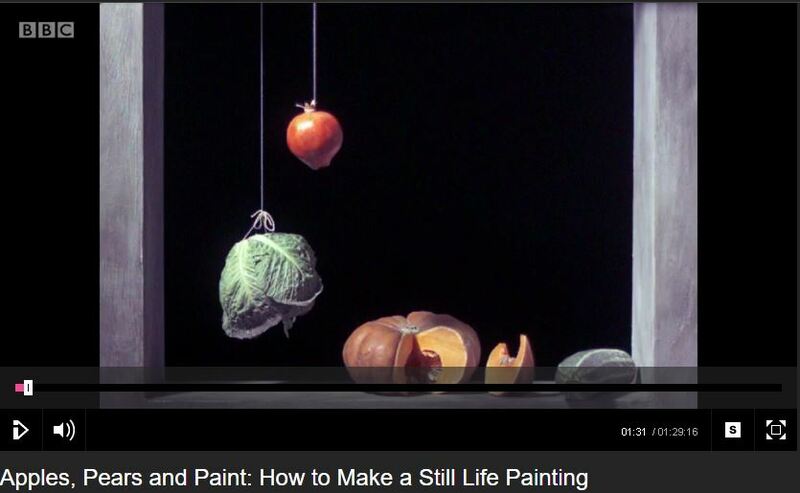 When I was watching the Documentary on still life, when the host showed all the art works the light is falling from left to right. My picture is the same way because of the position of the window I used. What difference would it have made if the light is coming from the opposite direction. In this composition, I am going to choose two objects with different surfaces, one is stainless steel and the other is ceramic. For this exercise I am going to observe the different reflections on the surfaces which provide an interesting interplay of light and shadow. Then practice drawing them by charcoal and putty eraser. 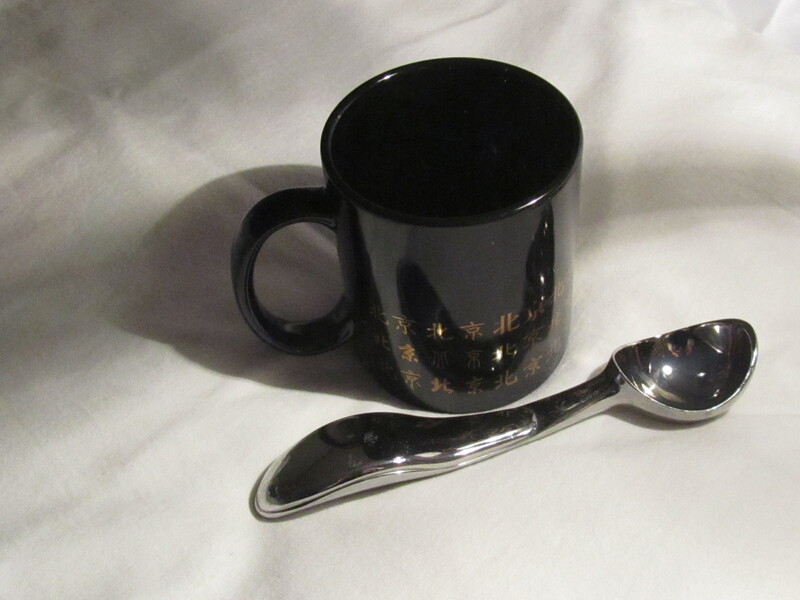 Looking around my house, I have found an ice cream scoop and a black mug which have high reflective surfaces. Stage 1. Take some photos and observe the objects in the lights and shows their shadows. Look at the pictures, they do have reflective surfaces and they provide an very interesting interplay of light and shadow. Stage 2. 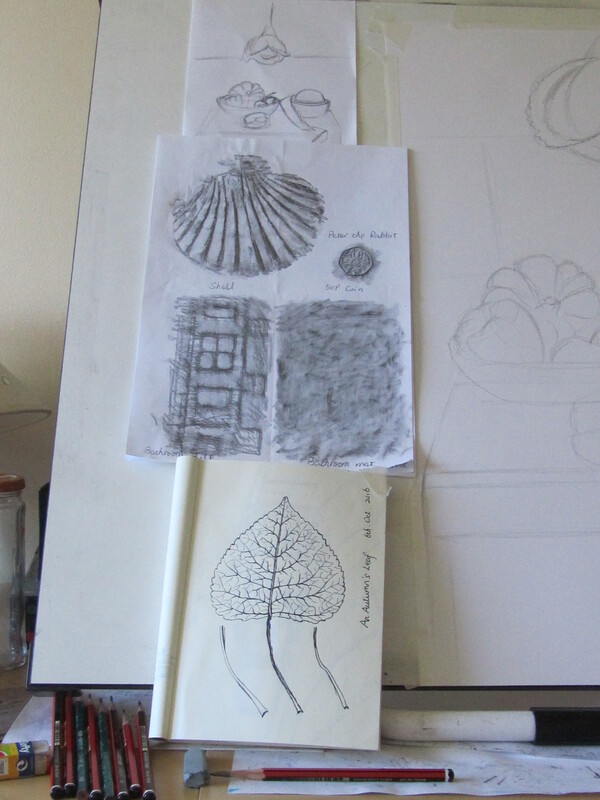 I am going to observe the shapes, reflections and shadows then practice on my sketchbook. Found out the brightest point where is the light casts on it. Analysis the reflection’s shape. 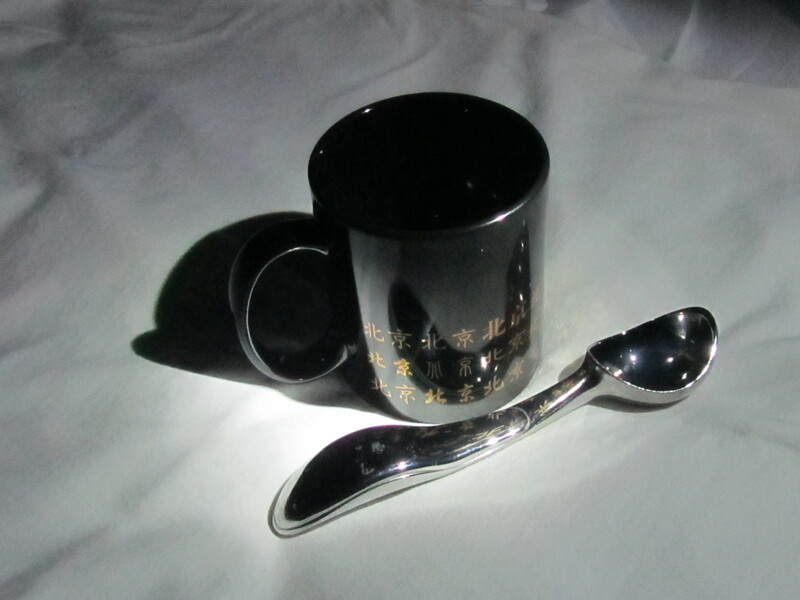 There is a reflection point where I captured it as below, is it the mug being reflected onto the scoop or is the light coming straight or on the other way? 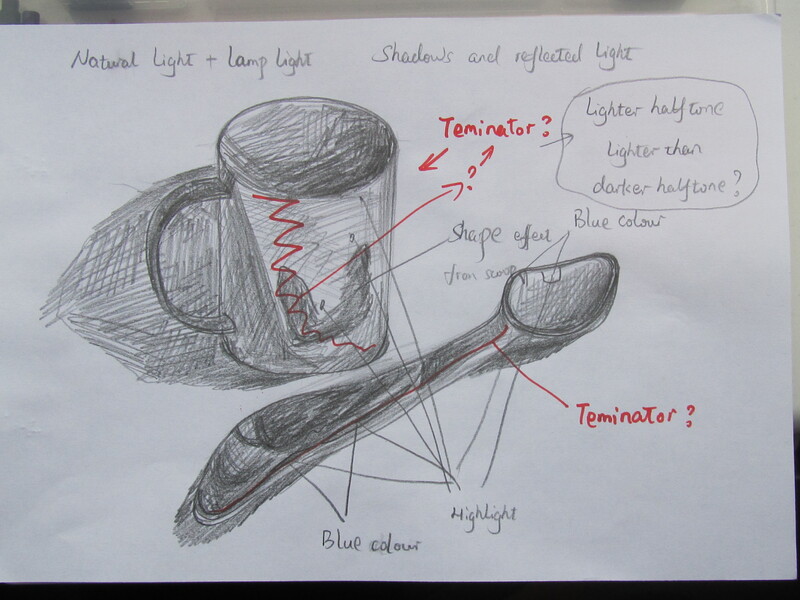 Then I am moving on to sketch the natural light and the lamp light. Compare these two lights I think the lamp light is at 90 degrees to the natural light. The shadows are more clear. The highlights are less bright, maybe I should change this lamp to a spot light. Also some reflection changed a little bit like the reflection on the scoop which is not as clear as it was before with one light source. After I am moving on only using only the lamp light in a dark room with closed doors and curtains. The head/ball of the scoop is in a highlight area. The highlight area and the reflection area on the mug are the same brightness I think. 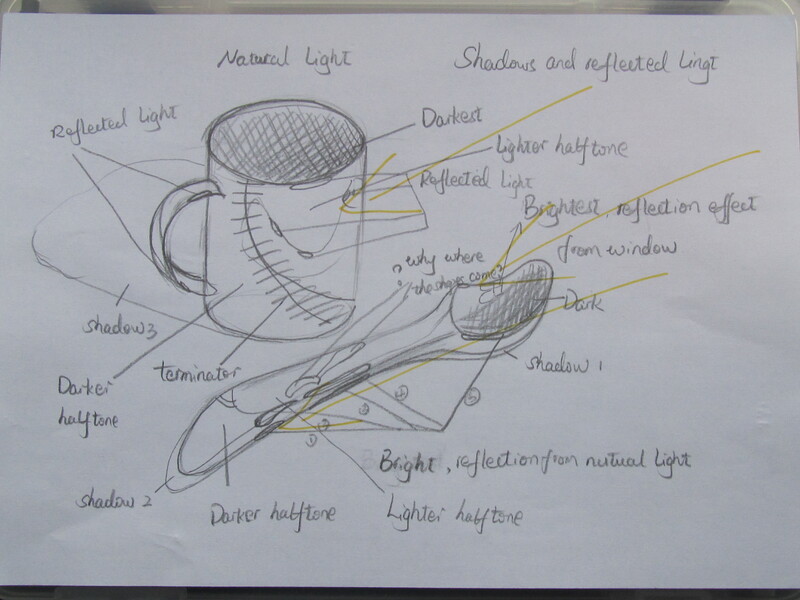 How can I build this drawing letting the objects shown all the different factors It is a challenge. 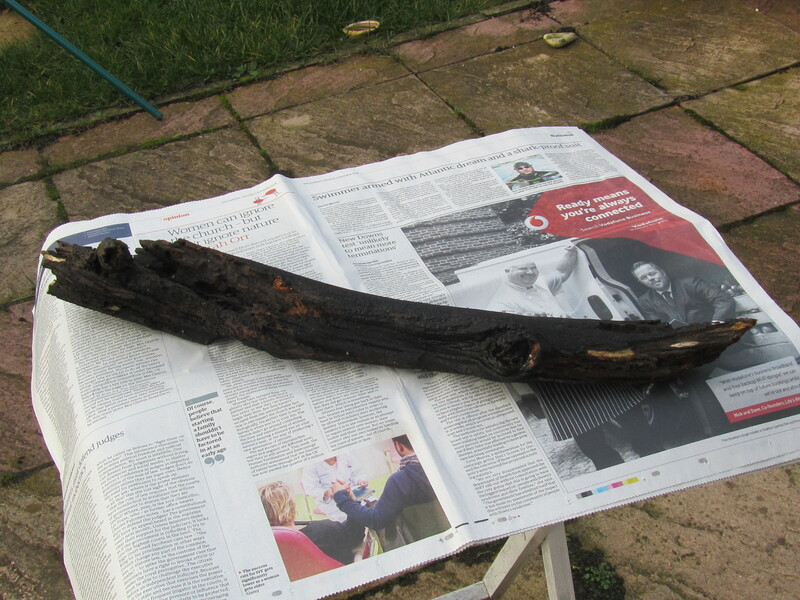 Finally I am looking at the torch lit one. I realize I shone the torch light on the centre of (in the front of) the mug which meant the left side of mug has a strong and clearly defined light (see the highlight area where I wanted to draw the defined/darker halftone). 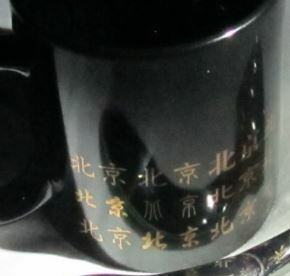 It has also happened on the right side of the mug just not as strong as on the other side? I think it is difficult for me to draw as regular objects. These lights hit on these two objects, different lights and on different area, the reflections are so much different. As I am the one in charge I have to gather up all these different elements and bring them together in one picture. Stage 2. 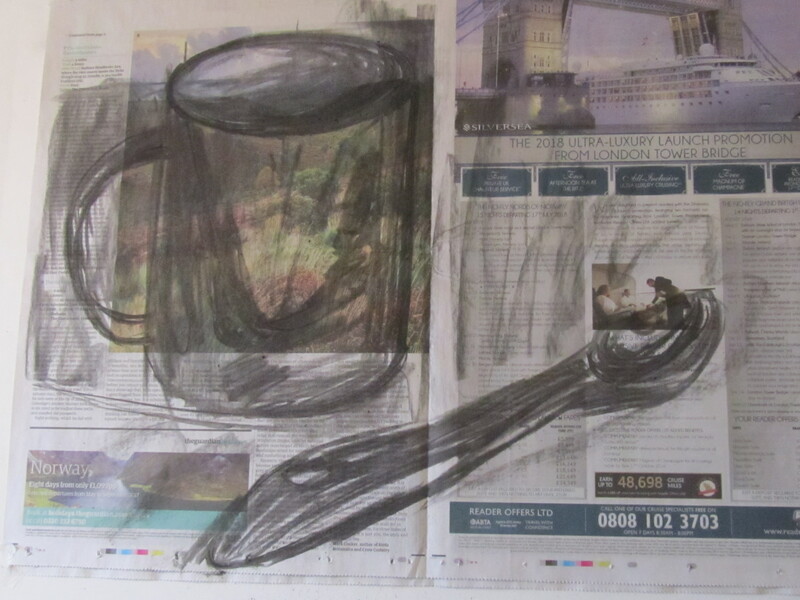 I am moving on a A2 newspaper just to enlarge the size and practice the objects’ proportion. I will make the mistakes on the daft and then fix them on my final picture. Stage 3. 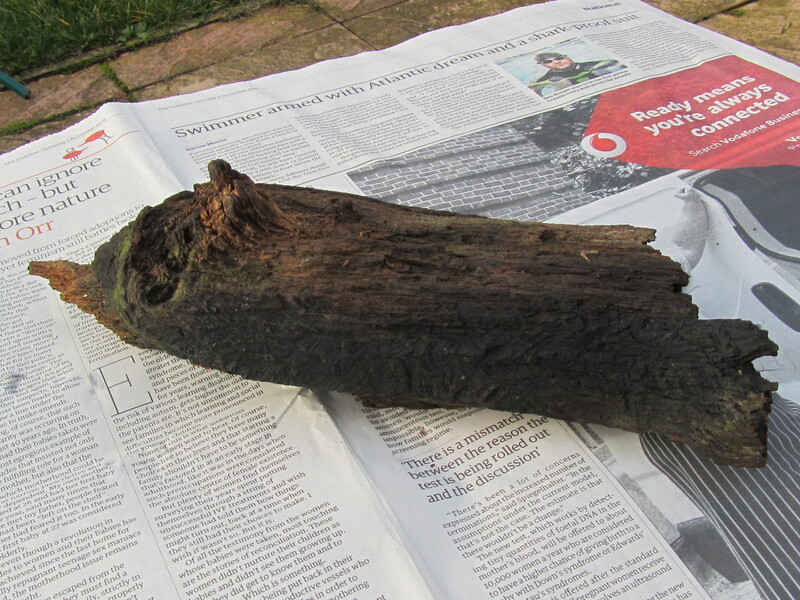 I am going to the final piece on a A1 white paper. First main problem is composition of a picture, they are too far to the left side. 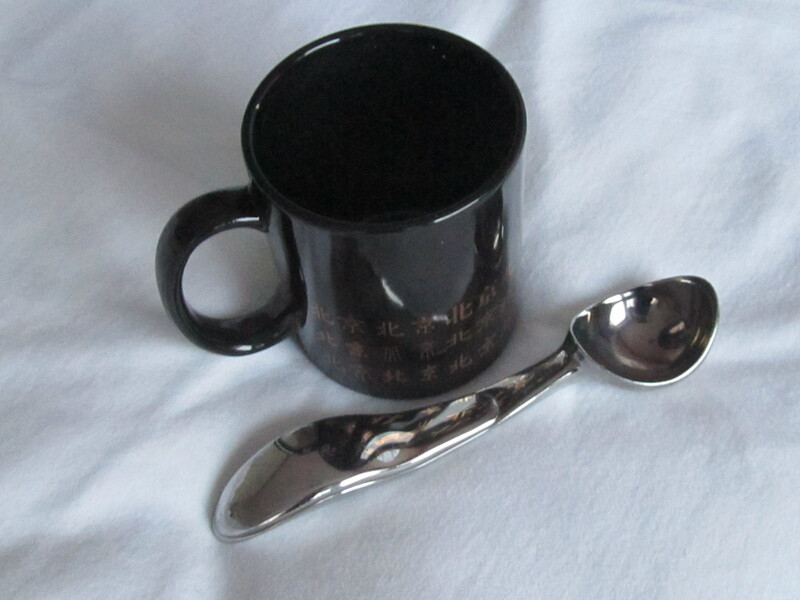 The ice cream scoops’s reflection is not quite right on the mug. The shape of the mug’s bottom is wider than the top. The handle of the mug, the lines are standing out. The mouth of mug, the border is not correct. The head of the scoop is a bit turning right. 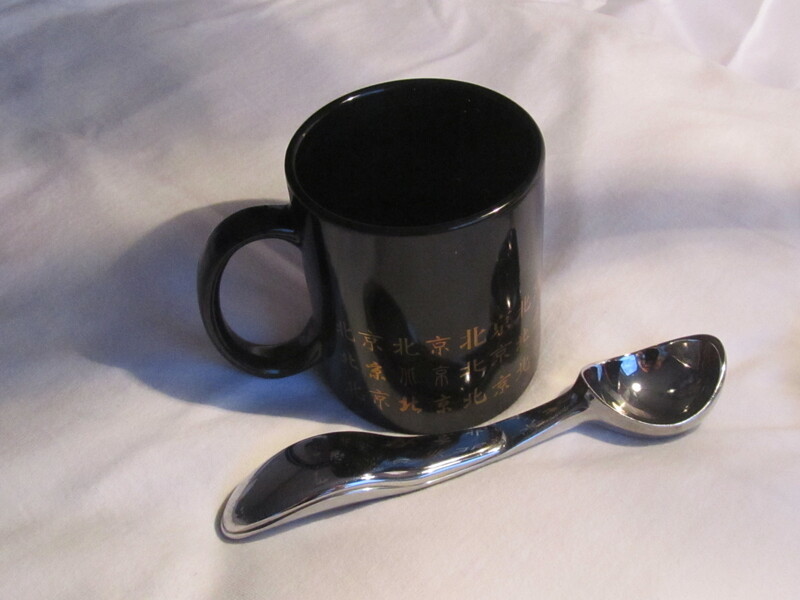 I have shaded the shadow of the scoop on the front of the mug. With the position of it I can’t seem to get the shape as I would like. It is too bent in my opinion. I was trying to draw the line of the shadow down the side of the mug it looks OK but I am not happy with the final position. 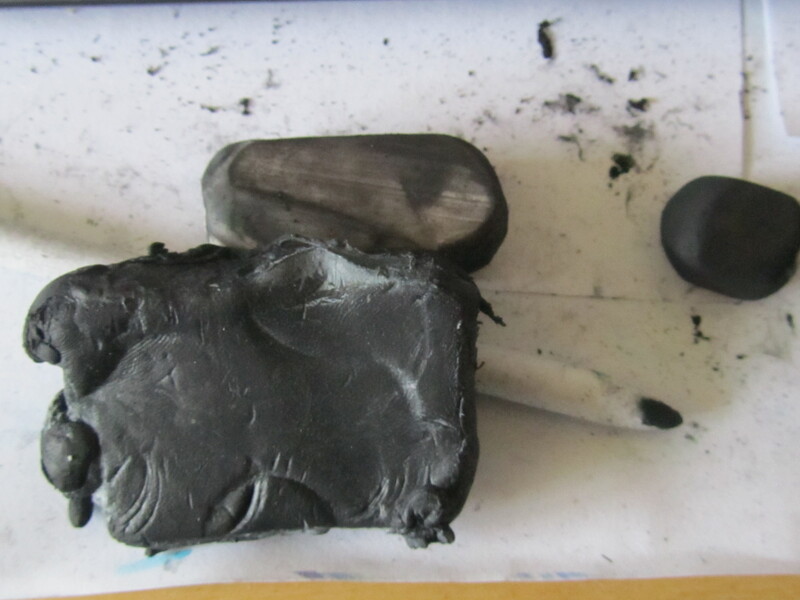 Next time I will make sure I have spare erasers as this is the state of mine after this drawing. In this section I am going to find out the art work of Odilon Redon. He is a French symbolist, printmaker, draughtsman and pastelist. I looked his articles which are on Wiki and some at his online museum. As this is in my drawing course, so my primary coverage is going to learning his drawing skills like how to use charcoal and pastels etc. One of his drawing which is similar to the one on our martial. 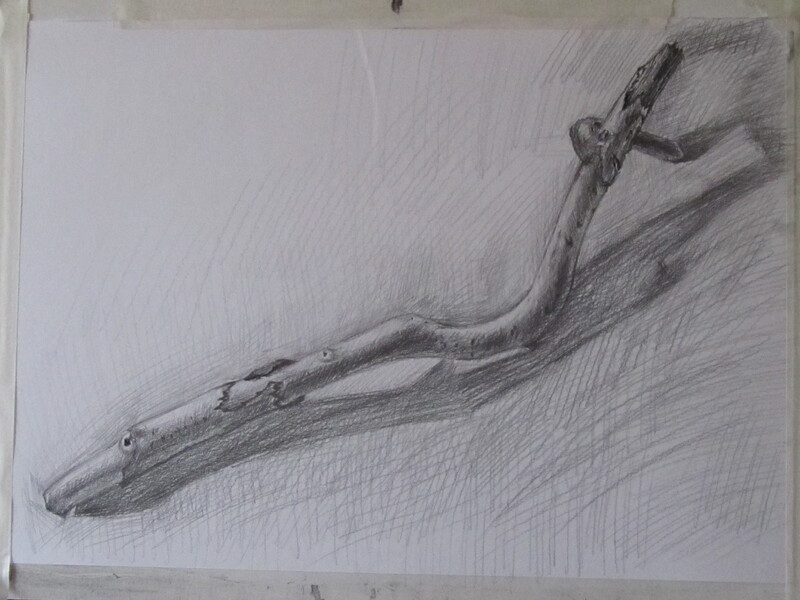 I do like the strong sense of light in the drawing and I think light is the life of drawing/painting. From the highlight to the darkest shadow are strongly contrasted. This is a monochrome drawing but from the highlight left top to the shadow/dark area down right are all well-bedded even the tree hole has been drawn vividly but you can still see the other shadow around it. I do appreciate the artist’s skill when controlling the light feeling in the entire of image. I have read some his article: Until his 50s, he worked almost entirely in black and white, in charcoal drawings and lithographs. As this is one of his art work when he is about 56. And I think this work were made in black charcoal . It has been said that he chose charcoal and lithographic chalk as an alternative to what he perceived was the dull daylight colour of the real world. This work is actually following the true light and real objects. 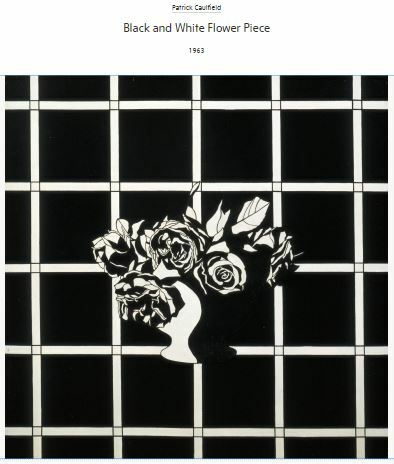 Graphic shadow was his defence against Impressionism, which he rejected. I especially appreciate his dealing with the shadows which they accentuate. He abandoned the black and white of his graphic work and turned instead to oils and pastels when he is 60s. 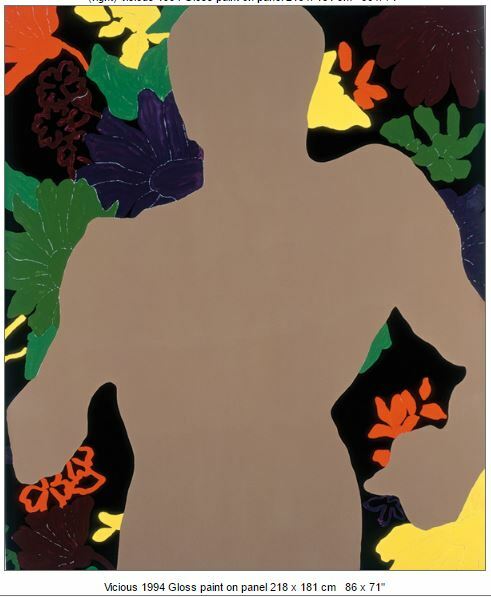 He began expressing himself in radiant colours, in visionary subjects, flower paintings and mythological scenes. These pictures are in colour not black and white but i still find the use of shadow interesting. I like the way it shows the shape if the horses pulling the chariot and the lines around the women’s dress. I will look at some more of his work as I study more. The sunlight, fluorescent or some else light source (reflected light) etc. strike on the objects to create orderly predictable series of tones. Organised and control their relationship of light and dark gradations is the key for building three-dimensional image. 1.For my geometric solid I tried to catch up their graduations but to form the shadows it needs to have more gradations. 2.My 3 objects drawing with “X”and “+” symbols, the graduations are scrambled. I may shade them more tones. 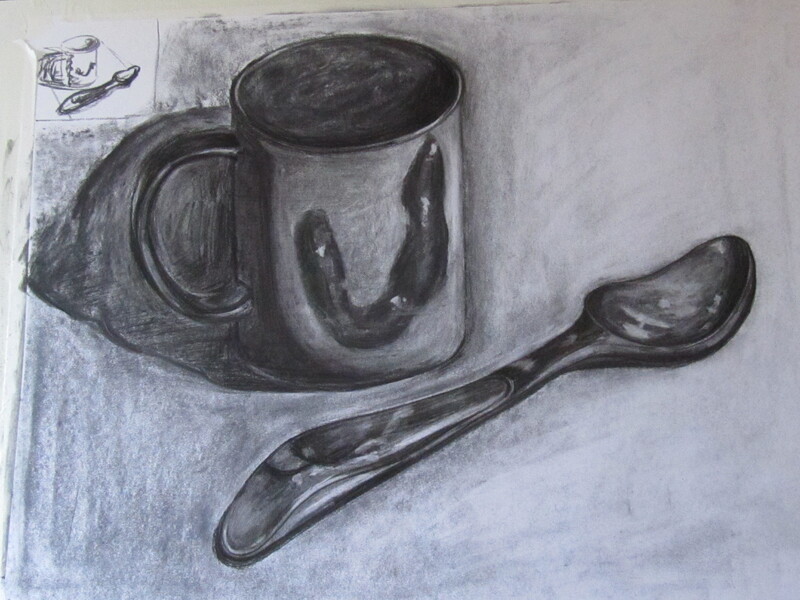 For the exercise observing shadow using blocks of tone, for which I have drawn a teapot and a plate. I am quite happy with the tonal contrast of outcome.